Author Richard Graber chronicles history of dance company, shares insights on running nonprofit. 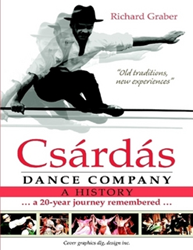 In 1994, author Richard Graber founded the Csárdás Dance Company, which would serve as the conduit for him to share his cultural heritage through the art of dance. With “Csárdás Dance Company: A History” (published by Lulu), Graber presents a 20-year retrospective on the story of how an ethnic dance company served as a vehicle for preserving his cultural heritage through dance. Through this project, the son of Hungarian immigrants further preserves his culture in the narrative of his life story. Based on his personal experiences, Graber’s journey is intended to be both a means of celebrating his own heritage and to inspire readers to pursue the same. Graber also provides his insights and philosophies on running a nonprofit organization. Richard Graber hails from Cleveland, Ohio, and is the son of Hungarian immigrants. Graduating from the Ohio State University Department of Dance and founder of the Csárdás Dance Company, he now lives in Houston and serves as director of grants, programs and services at the Houston Arts Alliance.